Menus are awash in “pajama foods,” items that evoke childhood favorites eaten while wearing jammies and parked in front of the TV. Potato chips, popcorn and ready-to-eat cereals all qualify, and their hip factor is being boosted by innovative chefs. Potato chips are pajama food that have been appearing across a broad spectrum of operations. Trendy, nationally recognized Milktooth, an independent in Indianapolis, offers the Beef & Bacon Sloppy Joe with bread-and-butter pickles and potato chips on top. It can be accompanied by a glass of Ovaltine for a double dose of nostalgia. Nearby Cafe Patachou creates the ODB Omelette with crushed potato chips, sour cream and scallions, and it can be washed down by whipped-cream-topped hot chocolate. Nashville’s sizzling restaurant scene got even hotter last September with the opening of Mop/Broom Mess Hall in the Germantown neighborhood, which features entrées like barbecue chicken with shaved cabbage slaw, toasted peanuts and crushed chips. On an ethnic note, the vegetarian Smoked Mushroom “Jerky” Fried Rice at Mission Chinese Food, with locations in New York City and San Francisco, is made with salty potato chips, sawtooth herb (also known as culantro) and red onion. Chains certainly choose chips. Bobby’s Burger Palace, a 17-unit early entrant in the better-burger derby, features the signature Crunchburger with American cheese and a pile of potato chips tucked into the bun. 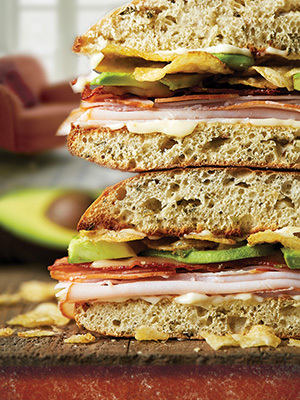 The Jalapeño Turkey Crunch Sandwich, left, which enjoyed a limited-time run at McAlister’s Deli last year, was crowned by jalapeño kettle chips that supplied both flavor and crunch. On the sweet side of the menu, Compost Cookies at 15-unit Milk Bar are made with pretzels and potato chips, along with graham crackers, butterscotch and chocolate chips. Cereal is jammie food, too, and it’s been undergoing a renaissance for the better part of a decade. Its recent renown stems from the groundbreaking menu at Milk Bar, which opened in New York City in 2008, immediately grabbed headlines and launched legions of imitators with specialties like its Cereal Milk Soft Serve, an homage to the slurpable sweet milk in the bottom of the bowl. The current bill of fare includes the eponymous soft serve alongside a Cereal Milk Latte and Cornflake Marshmallow Cookies. From the savory point of view, ready-to-eat cereals are a classic ingredient in home-cooked casseroles, and some chefs are updating the practice. Vintage Mac, the macaroni and cheese at Vintage in New Market, Md., is finished with a Rice Crispy Crumble. Elsewhere on a menu that touts its elevated comfort food is crispy Frosted Flake-battered chicken accompanied by hushpuppy waffles. Cornflake-crusted catfish with butterbean succotash is a special at Graze near Charleston, S.C.
Chain chefs, however, were way, way out ahead on this. They leveraged the appeal and merchandisability of cereal as an ingredient back in the 1990s, when a number of casual-dining chains such as Planet Hollywood lured little ones by putting items like Cap’n Crunch Chicken Fingers on the kids’ menu. Fast-forward to 2018, when Carl’s Jr. appealed to bigger kids with Froot Loop Mini Donuts in five fun and funky dayglow colors. Burger King got loopy last year, too, with Froot Loop Shakes followed by Lucky Charms Shakes, while 7-Eleven featured Cap’n Crunch’s Crunch Berries Slurpees for a limited time in the summer. Popcorn is another popular snack scarfed down while keeping one eye on the television screen. Now chefs have brought it into their kitchens. The Little Beet Table, which serves vegetable-forward cuisine in New York City and Chicago, garnished its roasted cauliflower hummus with popcorn and roasted pepitas. Acre in Auburn, Ala., paired roasted Gulf snapper with creamed popped corn, collard green spaetzle, barbecue peanuts and Brussels sprout slaw. Restaurants at Walt Disney World in Orlando, Fla., pluck popcorn off the midway to use as a topper for beer cheese and bacon soup at Territory Lounge and for the kurobuta pork tenderloin entrée at Victoria and Albert’s. It’s popping up in desserts, too. Diners can sate their sweet tooth with a snack of popcorn mousse and caramel corn at Flying Fish in Walt Disney World. D.C.-area diners can indulge in the Cinema Manhattan Cocktail at Ambar Clarendon in Arlington, Va. That decidedly adult special consists of bourbon infused with caramel corn, Port-Coca-Cola reduction and cherry bitters; and in a nod to its inspiration, the drink is served with a side of sweet-and-spicy popcorn.